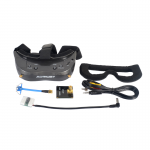 The SkyZone SKY03 FPV goggles are the latest release by SkyZone. Like Fat Sharks, SkyZone goggles have a really nice form factor, are sleek, light, and very easy to carry. When it comes to goggles, people are usually split into two camps: those who prefer these compact goggles, and those who prefer box goggles. Box goggles are generally found more immersive(sometimes too much, as you have to move your eyes around to get a full view of everything), but they’re quite bulky and difficult to lug around. The whole beauty of miniquads is in portability – the notion that you can throw all your gear into a small backpack and you’re ready to rip, which is why the smaller goggles caught on and became more popular than the larger goggles. 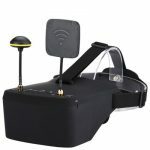 At its very core, a pair of FPV goggles is a rather simple piece of technology – there’s a video receiver, a screen, and some optics to get the image to focus at such close range to your eyes. 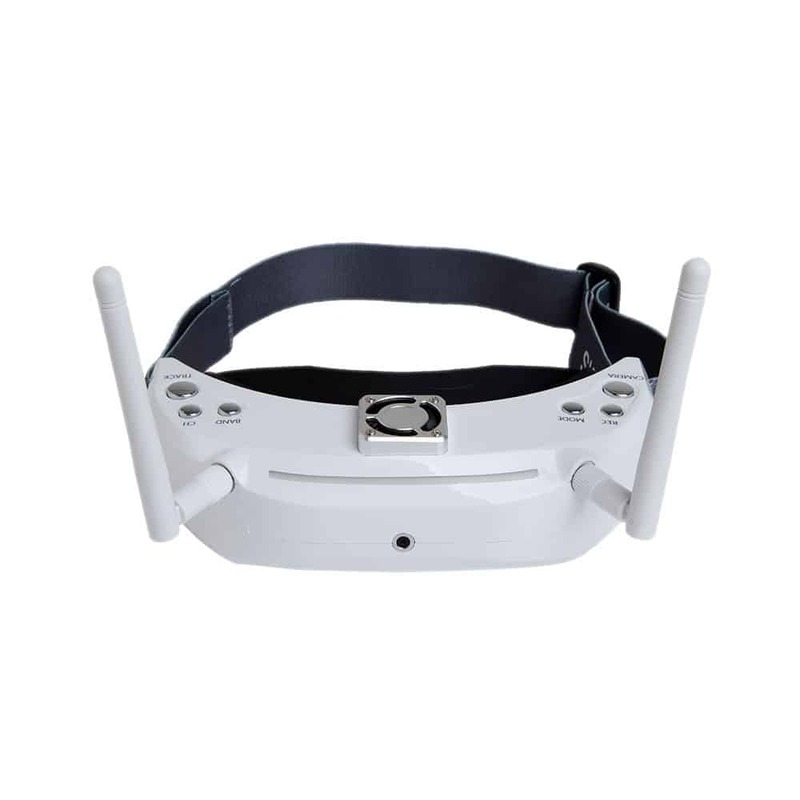 There’s also the ability to cycle through channels and bands, hook up an external video source through analog or HDMI, and in most cases a DVR(digital video recorder) to record your goggle footage onto an SD card. DVRs are quite critical – the footage is analog quality and nothing production-worthy, but DVR footage can help you backtrack and find a quad after an inevitable crash in a tough area. The IPD(inter-pupillary distance) is also adjustable so it can account for how narrow or wide your eyes are. 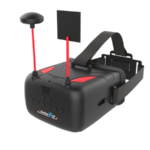 The main beef I have with Fat Shark goggles(the higher end ones like the Dominators) is that they’re very expensive and you have to buy the receiver modules and headtracking module(if you need it) separately. SkyZones have everything built in – you don’t need an extra receiver or extra headtracking module. This is both good and bad – it’s bad because if one thing goes wrong, then your whole pair of goggles may get decommissioned until you can get it fixed. It’s good because there is no extra hassle or expense of other gear – it’s all built in. The receiver module is a diversity receiver, which uses two antennas to receive video. The firmware then determines which of the two signals are the best, and shows you that signal. If you use a directional antenna on one side and a omnidirectional antenna on the other side, you can get some really nice range. SkyZones also have a neat feature of a built-in front facing camera that lets you see what’s right in front of you(in low-res) so you don’t have to take your goggles off! That’s a really cool feature and something I feel Fat Sharks are missing out on. I’d love to be able to not have to take the goggles off every time I need to check or adjust something, especially if I just want to see if the GoPro is recording or not, or if I’ve reset my radio’s timer/etc. The SkyZone SKY03 does have some interesting innovations compared to what the top end Fat Sharks currently offer. For starters, there is a little power button on the side that turns the goggles on or off. 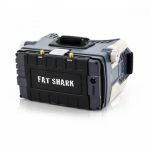 Fat Shark goggles automatically turn on as soon as you plug the battery in – you actually have to do a little mod to install a power switch. It’s a small touch but makes a huge difference, as fumbling around with the plug is quite a hassle compared to simply turning the goggles on or off. Next up, the SkyZones have a little OSD and visual menu built into the system, so if you change channels, you can see the band letter and channel number as well as the frequency displayed on the screen. This little display also shows you the battery voltage, which is a HUGE plus since you just have to pretty much guess the battery voltage on Fat Sharks(the battery packs do have an LED indicator but it’s not that accurate in my experience). Additionally, all the menu options are also easily changed through the OSD in the goggles themselves. If you want to turn the OSD off, a little button press makes it go away so your flight video is unobstructed. The front of the goggles has an RGB LED strip that you can configure and customize. Honestly, this seems really superfluous, just a form of bling rather than anything else. Here’s another interesting factoid: the spec sheet says the goggles can take 7 to 24 V input – that means you can plug in a very wide variety of batteries – including your flight batteries – you’ll just have to make a little XT-60 to barrel connector. The fit of the goggles seems to be questionable – many pilots have found it to be a little uncomfortable and not very well fitted to the contours of their faces. This could be a dealbreaker for you if it doesn’t fit well to your facial contours. It’s actually really surprising how SkyZone could screw up such an important design factor. Aside from that, the price tag is quite hefty compared to other Fat Shark alternatives like the Aomway commanders. You’re going to pay a bit more for the SkyZones – almost as much as you would for Fat Sharks. The SkyZone SKY03s are a lot of value for the money, for sure, with a couple of forgivable kinks that may bother some pilots. Personally, I really like the OSD inside the goggles that reads out the channel/band/battery voltage, and the fact that everything is combined into one unit rather than a bunch of separate units is also a plus point. However, if it doesn’t fit on your face, then what’s the point, right?